The novel I Am Legend by Richard Matheson has got to be the greatest book I've never read. It was the inspiration for The Omega Man, the recent Will Smith movie I Am Legend, and the awesome Vincent Price classic The Last Man on Earth. For any other sci-fi novel being the inspiration for three films that range from very decent to great would be a testament to the power and timelessness of your story. This book however was also the inspiration for George Romero's classic Night of the Living Dead and all of the zombie madness that has since followed. I have watched zombies get murdered in countless films, on hit TV shows, prepared for the zombie apocalypse and personally killed thousands of zombies (in video games) and all of it was inspired by Richard Matheson. Now that I'm done man-crushing I'll get back to the regularly scheduled review. 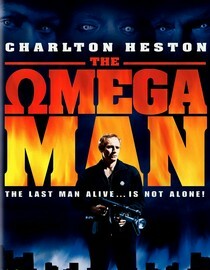 In this incarnation of Matheson's story, Charlton Heston is the last man on earth not affected by the biological war that ravaged America. By day he is free to roam the abandoned streets of L.A. but when night rolls around a group of albino freaks called The Brotherhood come out and try to kill him. Overall, I thought it was a pretty damn entertaining movie but like most films made in the 70's you can tell that they were trying way to hard to be hip. Don't get me wrong, I think it's cool that back then Heston's character had a strong, foxey black woman for a girlfriend but was all the jive talk really necessary? It took something away from it to me and the exchanges between the two characters was mostly awkward and at best corny. I guess they just didn't know how to write for interracial couples back then but they get kudos for trying. Despite being a little slow in the beginning I will recommend this movie because even if I didn't think it was well done at certain parts it at least kept me entertained. Why is it in your queue? Cool cover plus I saw it was based off of I Am Legend. Best thing about the movie? The awkward birth control joke, you'll know what I'm talking about. What mood should I be in to watch this movie? Looking for some classic sci-fi/horror with a touch of 70's corniness. I Am Legend was a great book. The Will Smith movie was an abysmal adaptation. It might have been an abysmal adaptation of the book but I don't think it was as awful as everyone says I think it was just a victim of it's own hype. I thought it was decent but it's nowhere near as good as the Vincent Price classic. I do need to read that book!